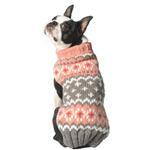 The Handmade Fairisle Wool Dog Sweater - Peach is a stylish way to keep your dog warm this Winter and Fall! Winters can be tough on our delicate pups, so bundle them up in the Handmade Fairisle Wool Dog Sweater - Peach! This high quality dog sweater has a classic fairisle design on its peach and gray handmade wool. Handmade wool dog sweaters from Chilly Dog are made with hand knit organic wool and all natural plant dyes, perfect for the Eco-conscious pet owner. This sweater is also made following the Fair Trade guidelines and is knitted by descendant's of the Inca Indians. Because every sweater is handmade, they may vary slightly in color and style. Your dog is sure to have a comfortable winter and fall with the warmest sweater around! Handmade Fairisle Wool Dog Sweater - Peach Customer Photos - Send us your photo! If only they made matching ones for pups' humans! This is THE perfect sweater for this super cold weather. SO well made and thick. The peach color really compliments her coat, too. Anxious for more of the styles to come back in stock because they're well worth the price and by far the thickest, sturdiest, nicest sweater I've ever purchased! Bichipoo Jordie loves playing outdoors on wintry days in her pretty peach Chilly Dog Sweater. Posted On 07/27/18 by Ronda from , OH Yes, Ronda recommends this product! Posted On 02/03/18 by Susan G from West Lawn, PA Yes, Susan G recommends this product! Chilly Dog sweaters are our favorites and this one has beautiful colors. They fit so well and the wool is perfect for frigid weather. They are always well made and durable for very active dogs. Thanks for processing my return so quickly , and making it easy to get a replacement. Woof!